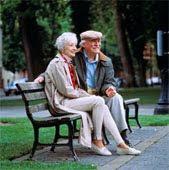 One fine day, an old couple around the age of 70, walks into a lawyer's office. Apparently, they are there to file a divorce. Lawyer was having a hard time trying to get the papers done, because he felt that after 40 yrs of marriage at the age of 70, he couldn't understand why the old couple would still want a divorce..
"I really love u, but I really cant carry on anymore, I'm sorry.."
"Its o.k, I understand.." said the husband. Looking at this, the lawyer suggested a dinner together, just 3 of them, wife thought, why not, since they are still gonna be friends.. The first dish was roasted chicken, immediately, the old man took the drumstick for the old lady.. "Take this, its your favorite.."
Looking at this, the lawyer thought maybe there's still a chance, but the wife was frowning when she answer.."
"This is always the problem, you always think so highly of yourself, never thought about how I feel, don't you know that i hate drumsticks?" little did she know that drumsticks was the husband's favorite. little did he know that she hates drumsticks even though all he wants is the best for her. "To my dearest wife, by the time you're reading this, I'm sure I'm no longer around.. I bought this policy for you, though the amount is only $100k, I hope it will be able to help me continue my promise that I have made when we got married.. I might not be around anymore.. I want this amount of money to continue taking care of you, just like the way I will if I could have live longer.. I want you to know I will always be around, by your side... I love you.."
"When you love someone, let them know... You never know what will happen the next minute.... Learn to build a life together.. Learn to love each other. For who they are.. not what they are..."